The artwork of Lorraine Kovenz Bushek. 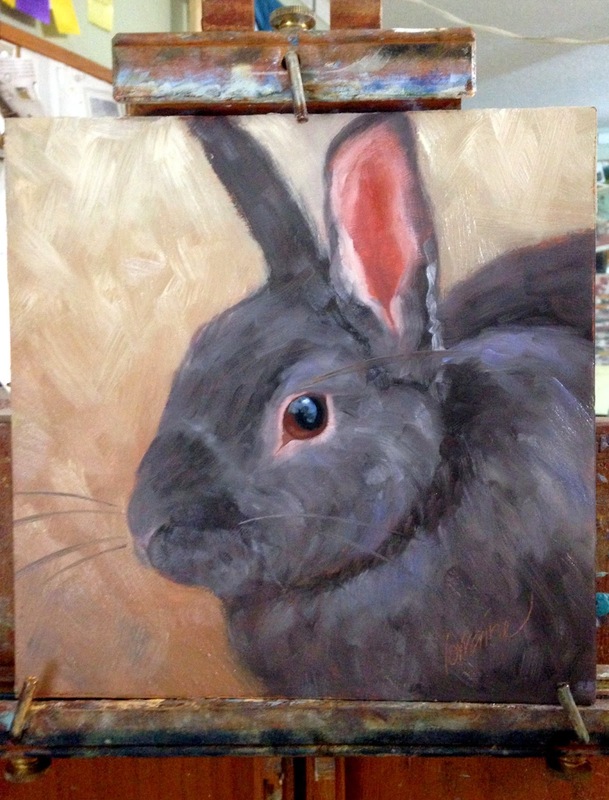 Harlequin Rabbit was painted for the Oregon Society of Artists November 2014 show, "200 Paintings for Under $200". This painting will be for sale at the show. The show opens Friday, November 7th, 6pm to 9pm, with a reception at the gallery. A still life of white things: light bulb, a milk pitcher, egg shells and a white table cloth. 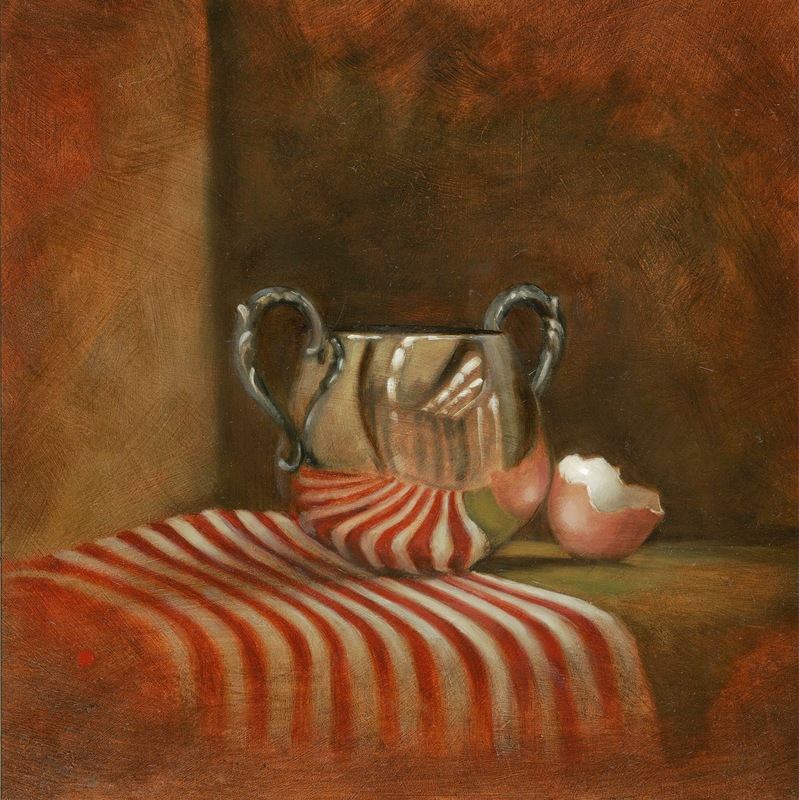 This painting will be for sale in the Oregon Society of Arts November Show - "200 Paintings for Under $200". Show opens November 7th, with a reception, 6pm to 9pm. 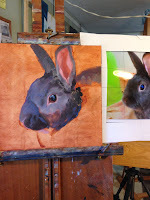 Here is the painting start and finish. Today's painting is of the rabbit Mushroom. 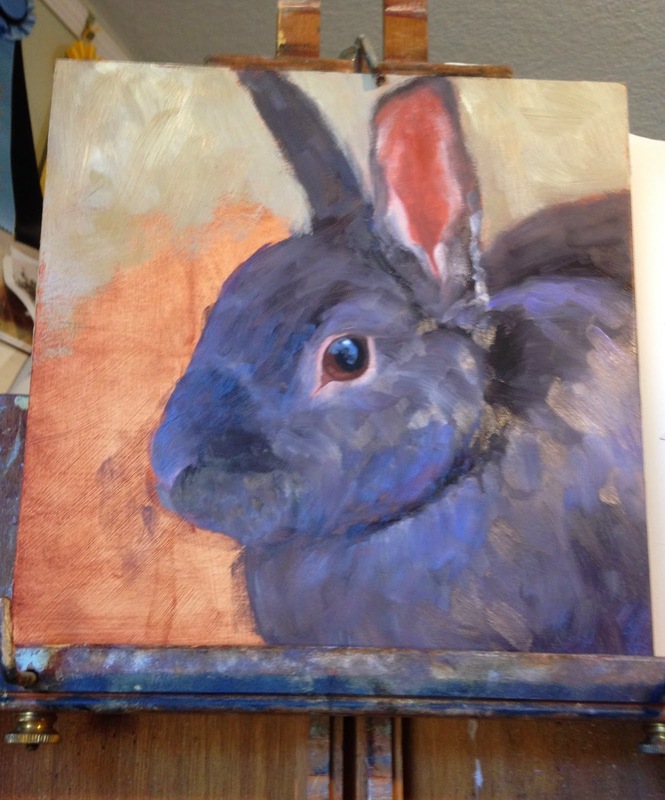 This is a commission on a 10x10 birch cradle board, may favorite painting surface. Here is the start; as usual I started with the eye. This is the most important part because it draws the viewer in. I will post more pics as the painting progresses. As you can see I always tone my canvas before painting. 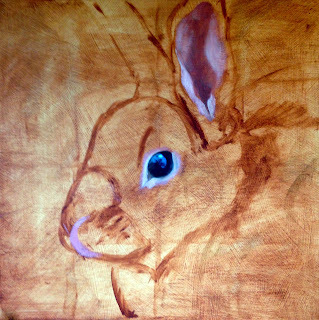 I normally use a burnt sienna wash just enough to get rid of the white. If you draw an imaginary line from corner to corner diagonally you will see that Mushroom's eye is dead center of the canvas. 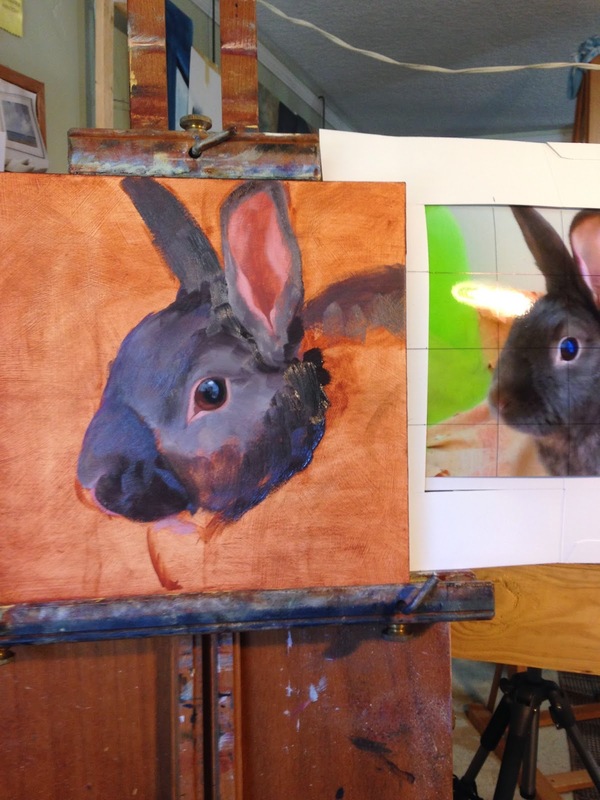 Here is the progression of Mushroom's painting. This guy has notched ears from his rough and tumble life in the California desert country. 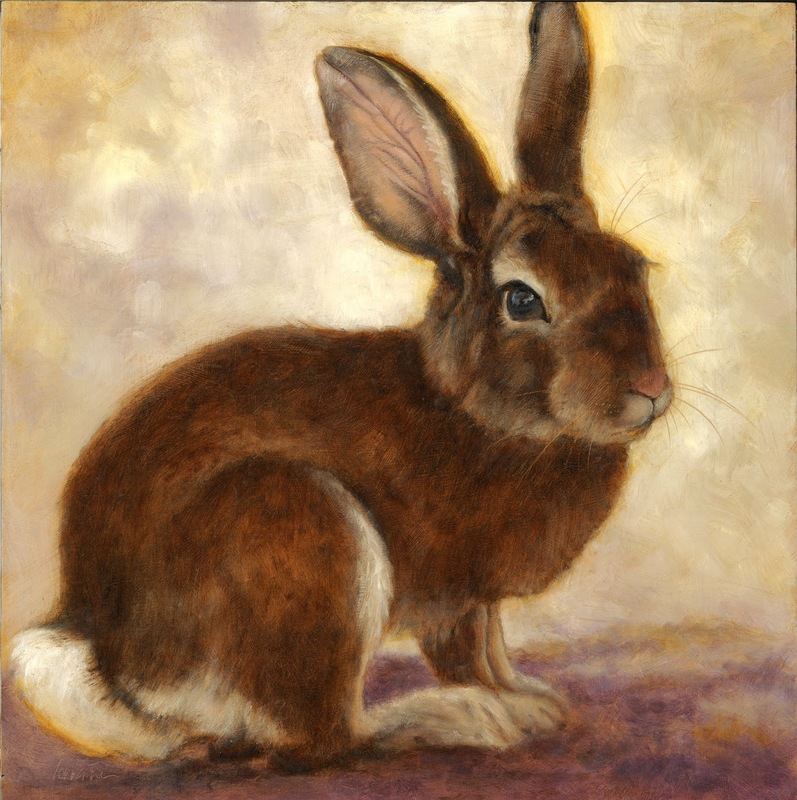 He is a native desert cottontail. 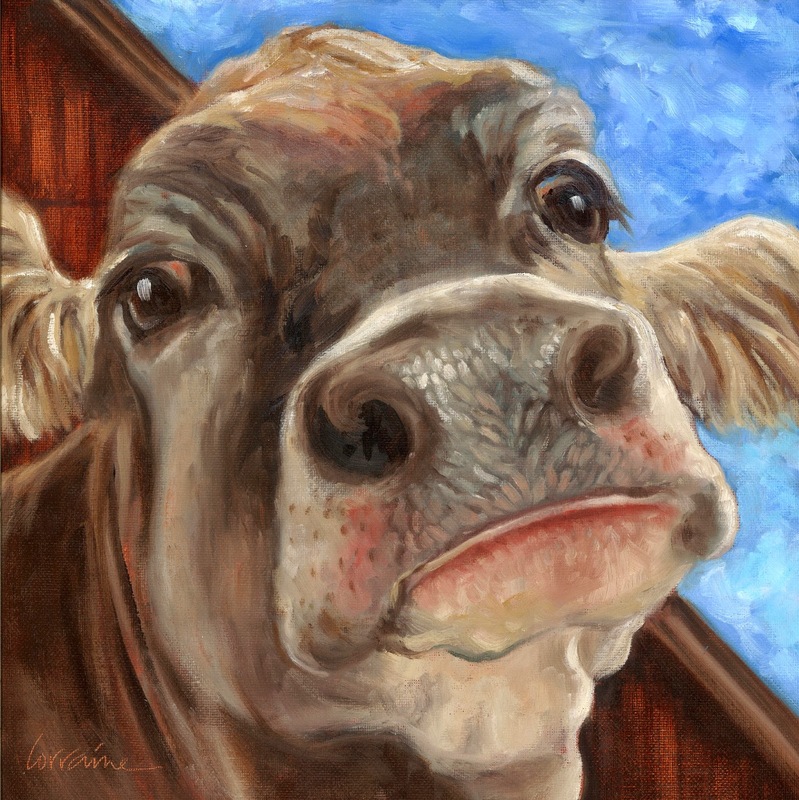 Many thanks to David Gray for the photo this painting was taken from. 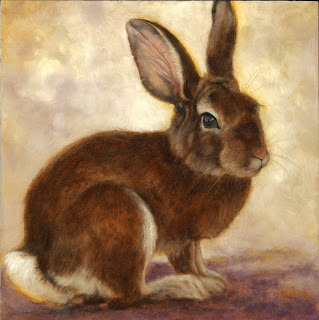 A native Oregonian, I am an artist, an animal lover, and a volunteer with the Rabbit Advocates - a 501(c)(3) non-profit organization dedicated to promoting rabbit welfare by educating the public about the care of domestic rabbits and finding loving homes for unwanted or abandoned rabbits. I studied fine art at Oregon State University under the guidance of Nelson Sandgren and I live in Portland, Oregon with my husband, 1 cat and 3 rescue rabbits (the number is ever-changing), koi and Pacific Tree Frogs. Presently I am on the Board of Directors for the Oregon Society of Artists, 2014 Gallery Chairman.